1. 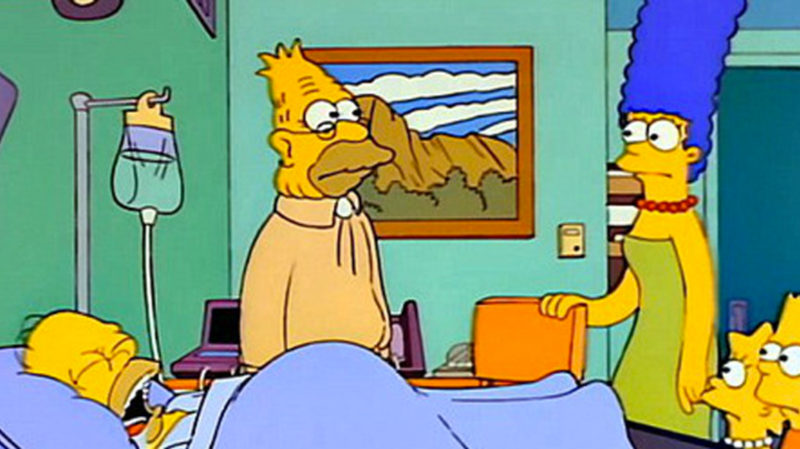 Homer is in a coma. Homer: God, I gotta ask you something. What's the meaning of life? God: Homer, I can't tell you that. God: You'll find out when you die. Homer: I can't wait that long! "So It's Come to This: A Simpsons Clip Show" (April 1, 1993) aired six months after "Homer the Heretic" (October 8, 1992). Producer Al Jean has dismissed the theory. 2. 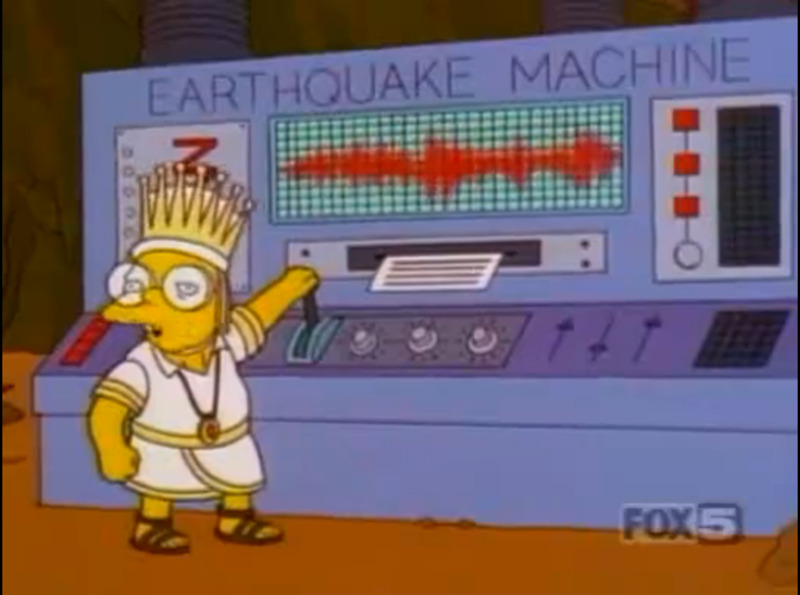 All the Simpsons are geniuses. A fan theory from Reddit hypothesizes that every member of the Simpsons is a genius, but only Lisa chooses to embrace it. Marge was shown to be an excellent student, but ultimately chose Homer and a family over a career. In the episode "HOMR," Homer became a genius after having a crayon removed from his brain, but chose to have the crayon re-inserted to avoid being ostracized by his friends. Even Bart is a genius (he's shown a natural aptitude for languages and complex schemes), but chose a life of debauchery, because, like Homer, he found it more satisfying. Lisa chooses to embrace her intelligence, while all the other Simpsons choose happiness. 3. Homer is still collecting royalties from The Be Sharps. How are the Simpsons able to afford a large home, two nice cars, and hundreds of adventures and trips on Homer's salary? A theory from Reddit postulates that Homer still receives royalties from The Be Sharps, his Beatles-esque barbershop quartet from the episode "Homer's Barbershop Quartet." This theory is supported by the fact that the other members of the band (Barney, Apu, and Principal Skinner) also have unexplained wealth. Barney has a bar tab so high that only NASA can calculate it, Apu drives a nice sports car, and Principal Skinner lives in a nice house in an affluent area. 4. Maude Flanders is a sociopath. According to a fan theory that first appeared on the No Homers fansite, Maude Flanders was a sociopath. The poster, Diversity Pumpkin, points to several scenes that suggest Maude hated Ned and wanted to kill her husband before her death in season 11. On several occasions—be it during a bear attack, imminent comet, or rooftop danger—Maude either left Ned for dead or showed no concern for him. After she passes away, the imprint on her bed is facing away from Ned, meaning that she spent every night facing away from her husband. 5. There are multiple Molemen. Over The Simpsons' long run, Hans Moleman suffers repeated fatal injuries as a running joke. A theory, originally posted by the Redditor /u/arin3, suggests that each of the these Molemen is actually a different person. A commenter expands on this theory, writing, "They are a race of human-mole hybrids that live under Springfield. In their gradual attempts to take over the world they are taking up jobs one by one in Springfield. Luckily though, Homer's shenanigans kills them off as fast as they can come to the surface." The theory is further supported by the season 11 episode "Hello Gudder, Hello Fadder," where Homer encounters a race of underground Molemen. 6. The Simpsons live in Springfield, Maine. In what state do the Simpsons live? This is one of the longest running mysteries of the show, but one dedicated internet detective believes they have found the correct answer. Using clues from the show and the process of elimination, the theory narrows down the Simpsons' home state to Maine. You can read the full explanation here. 7. Springfield exists outside time and space. 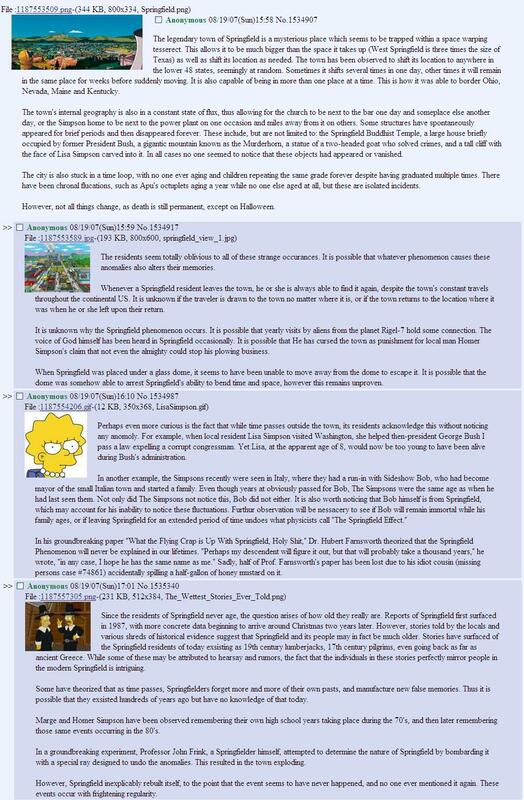 Another fan theory argues that Springfield isn't in any state, but actually exists outside of time and space. Known as the "Tesseract Theory," it states that Springfield exists within a tesseract and is constantly changing location. According to the poster, "This allows it to be much bigger than the space it takes up (West Springfield is three times the size of Texas) as well as shift location as needed. The town has been observed to shift its location anywhere in the lower 48 states." This also explains why landmarks like the Murderhorn can exist in one episode and be absent the next, and why the characters never age.